This is one of those shots out of the archive. I took it with my good old Canon 300D – My first SLR. Its dated 20/4/2006 and from what I remember I was just wondering around the city, sighted this, lined up the shot and fired away. 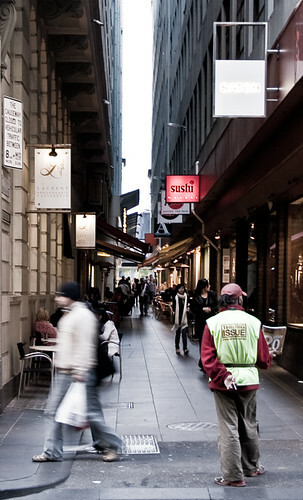 This is on Little Collins St, looking down The Causeway (one of the many interesting lanes in Melbourne). The Big Issue is typically sold by homeless people trying to make some money, earning half of the profits from the magazine they sell. Good to see these people giving it a shot, instead of just slumming it around the place begging for money. I keep on saying I want to buy one… and I will one day.